I hyperbolize now and then. I just get kind of excited about things, you know. And this results in my mind sorting through its shelves of adjectives and quickly reaching for the binder labeled, ‘superlative’ and then spilling the contents everywhere. “Amazing!” “Perfect!” “Even more perfect!” “Absurdly and/or uncontrollably great/fabulous/wondrous/awesome/stupendous” “The most mind-boggling, off the hook, and all together unbelievable paragon of X ever to have graced the face of the Earth…” That kind of thing. So I was thinking of trying to use understatement for effect, for a change. Go all Garrison Keillor and say, “oh ya, these were pretty good Brussels sprouts.” But, I couldn’t. Because they weren’t. They were really crazy good Brussels sprouts. So I’m going to go ahead and call them that. Both Joel and I take great delight in Brussels sprouts. When faced with a platter, I know I am likely to dive in, greedily shoveling disproportionately large scoops of them onto my plate and barely resisting the urge to simply grab the platter to my chest and make off with it to some remote corner where I can consume the spoils of my conquest without sharing. Joel gets a look in his eyes that makes me think that he just may be feeling the same thing. I’m surprised we haven’t gotten into any fights about who gets the last Brussel sprout yet. I’ll admit, I’ve pouted about it before. Unless the Brussels sprouts are boiled or steamed. Yuck. Don’t do that to your Brussels sprouts, ok? They don’t deserve it. Not when you can sautee them until they are sweet and tender and a dark, golden crust forms on the outside. 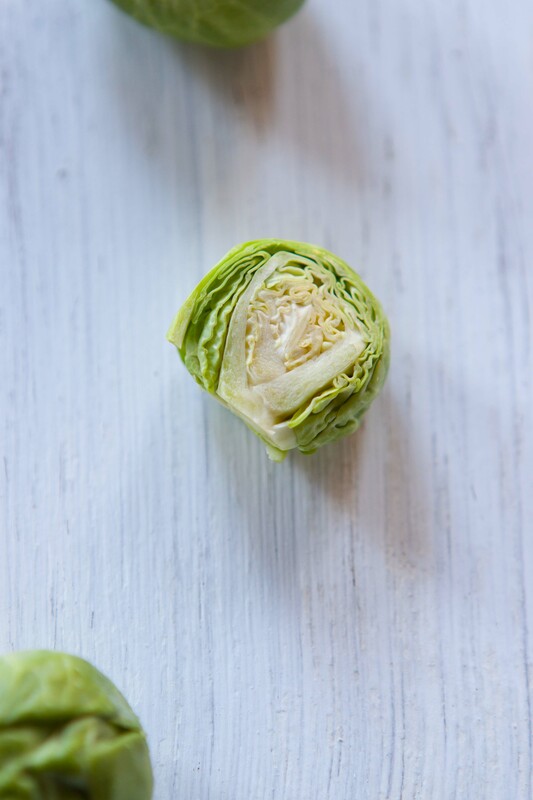 I’m addicted to sprouts that have been held against the fire, so to speak, so long that they are nearly charred, with a sprinkling of vinegar for acidity and a generous amount of salt to bring out all the other flavors. And occasionally some bacon. I thought I was never going to need a change of method. Until I discovered the unexpectedly delicious alchemy of Brussels sprouts and molasses. I never would have thought of this myself. Still when I hear it, it sounds somewhat counterintuitive to me. I got the idea from a friend. This friend of mine, who is an extraordinarily good cook, mentioned to me that a friend of hers – who she says is an extraordinarily good cook, which probably means it will turn out to be Thomas Keller or something – served her Brussels sprouts sauteed with garlic and a hit of molasses and that it was delicious. I’ll admit, I had a moment of dubiousness. A pretty long moment, in fact. In my brain the combination didn’t work. But, I decided hey-ho for giving something new a try, especially when recommended by joint extraordinarily good cooks, and I went for it. Wow. Allow me to repeat, wow. 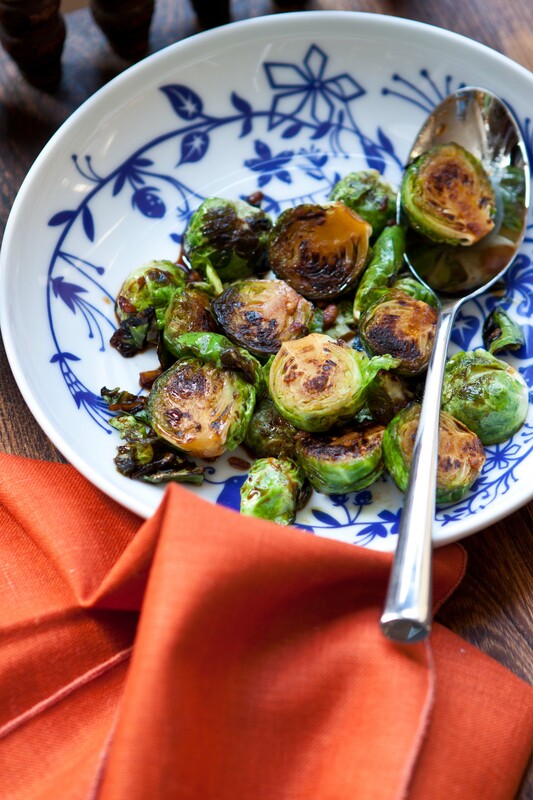 The Brussels sprouts, caramelized, salty and almost crisped on the outside combined with the aromatic warmth of garlic, snuggle into to the molasses like a little child cuddling his security blanket. The sweetness and bitterness of the molasses echos those characteristics in the Brussels sprouts, but in a rich mellifluous baritone. One you would want to sing you to sleep while sitting under a willow tree by a lazy river. The flavors are powerful, but they balance one another beautifully. My Thanksgiving table will have a new side dish this year. And once again I feel like I may never need a new way of preparing Brussels sprouts. I think I could be content with this one for life. Then again, it appears that it pays to stay open. In a very large sautee pan, heat the butter and the olive oil over medium-high until the butter is melted and bubbling. Put the Brussels sprouts into the pan cut sides down. Leave them to cook without stirring them around for several minutes (3 or so), until the cut sides of the sprouts have developed a brown crust. Then flip them all. Sprinkle with salt, add the garlic, and continue to cook for another couple of minutes. Next add a little splash of water (about 1 Tbs.) and the molasses. 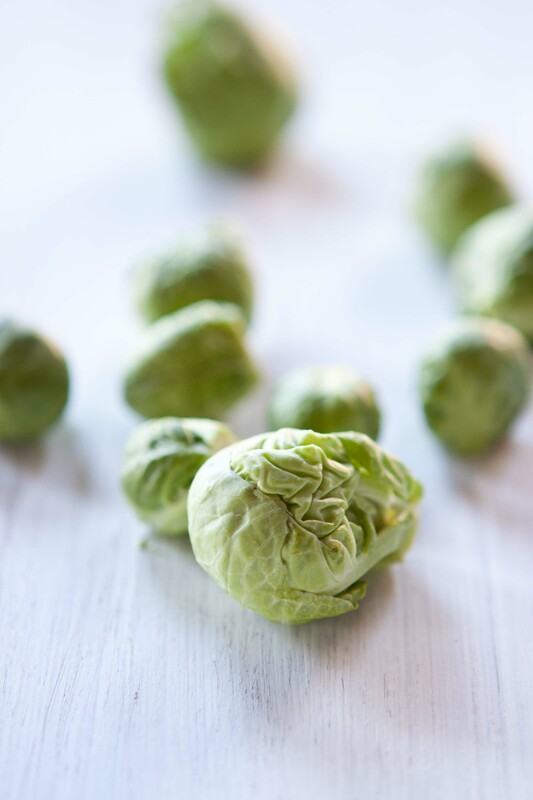 Turn the heat down to medium-low and cook, stirring frequently to get the Brussels sprouts coated with the molasses as it thickens. Cook until the Brussels sprouts are tender, several more minutes. Transfer to a serving bowl and serve! You should also try roasting them (olive oil, salt, pepper), then they have a great crisp texture. And if you like the bacon flavor there is such a thing as Bacon Salt, we then put olive oil on them and sprinkle the Bacon Salt and roast it. The roasting is about 375 for 20 minutes. This is great with broccoli, potatoes, etc. Ah yes, roasting! I do actually roast Brussels sprouts pretty frequently. It was my ‘one’ method before I moved on to sauteeing. I can be so fickle! I’ve never used bacon salt before though! Cool idea. I actually love sprouts and usually roast them, but the molasses action going on in this recipe sounds really great. The molasses really makes this dish different from other ways I’ve had sprouts. Try it! I think this side dish will make it to our Thanksgiving dinner table. Thank you Susanne! I hope you enjoy them. these DO sound really crazy good. Along with FreshandFoodie, usually I just roast the little guys until they’re black and crispy and delicious – i’ll try your version next time. Mmmm, black and crispy Brussels sprouts. 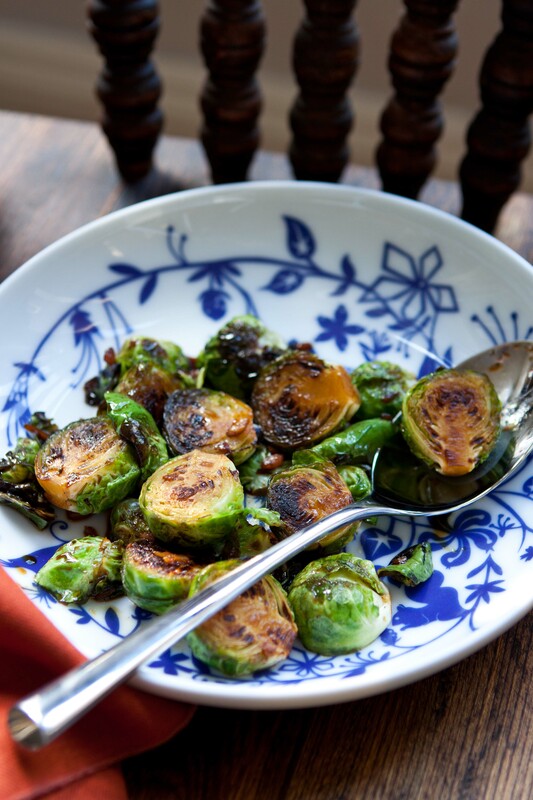 Did you know you can also grill Brussels sprouts to get them all black and crispy on the outside!? Thanks Emiliy; these were terrific… we will see them at Thanksgiving ; paired tonite with sauteed chanterelles and roasted halibut cheeks. Yay! Glad you liked them Mark. I’m jealous of your chanterelles and halibut cheeks. Yum! I have always loved brussel sprouts, and then I psychopath loved them after I grilled and tossed them with lemon zest, shaved grana padano, and evoo. But since you used the word mellifluous, I will be trying your recipe next. Thanks. Psycopath loved them – love it! So I finally got around to making your “Really Crazy Good Brussel Sprouts”. I would be lieing if I told you I wasn’t a little hesitant when I poured the molasses in the pan, but I was. I thought they would have been perfect slightly charred with a squeeze of lemon. Soon my husband came home, and upon walking in the door he made a hearty ooof-like exhale and exclaimed how amazing it smelled in the kitchen. I plated up dinner, salt and pepper seared chicken breasts with a white wine, tarragon, pan dripping, cream and butter sauce (yes I am a gluten) and a healthy serving of sprouts….OMG…THEY WERE FREAKING AWESOME (sorry, I had to yell that). The more I ate the more I wanted, and my hubby thought they were the best brussels he’s ever had!!! Thank you for the addition to my ‘what’s for dinner arsenal’! I don’t enjoy brussel sprouts at all,but I do love the beautiful plate! Isn’t it a cool design? I got them from a friend. They’re by a Dutch designer named Tord Boontje. I am going to try these in the next day or so. I have always been a maple syrup and bacon girl when it comes to brussel sprouts however molasses just might trump that. 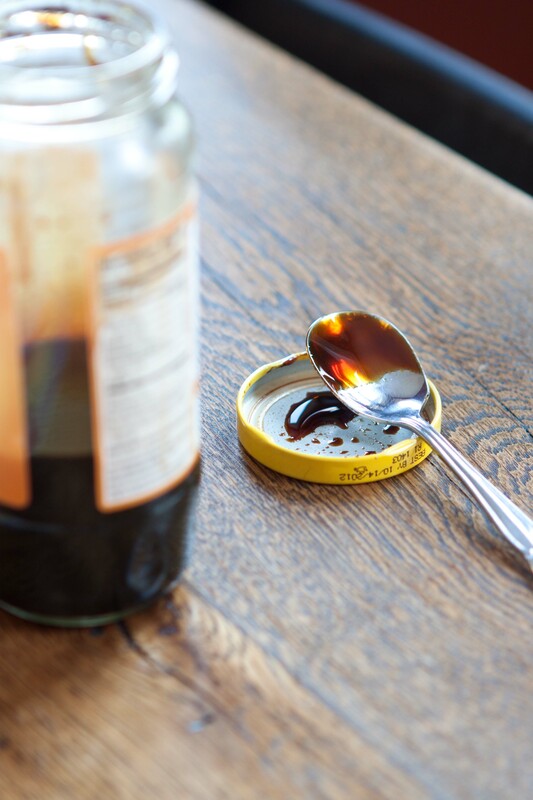 I adore molasses, even a big spoonful in my coffee! Thank you for passing on this gem of a recipe. Molasses in coffee??!! I am going to have to give that a try some time. The other best way to have molasses is with some fresh cornbread and buttermilk. Mmmm. These do sound crazy good! I can relate to you wanting to run off with the platter of Brussels sprouts. I usually roast mine with olive oil, salt and a little maple syrup. I have to double the usual amount because so many sprouts will be snatched off the pan by my family before dinner is served. I will never complain that my kids sneak Brussels sprouts! I like your addition of molasses here and will try it next time (and saute them). Oh my gosh yes! Always make extra so there are still some left over even after the nibbling. Your children obviously have very good taste! Like most everyone else here, roasting has been my favorite way of cooking the baby chou chous. And I have also tried dressing them with maple syrup or balsamic vinegar. And I’ve gotten absurdly decadent and made them into a cheesy gratin. But molasses? What a crazy good idea! I was looking for something new to do for the holiday. I’ve been thinking about trying them as a gratin too, with a potent blue cheese. But, I think this molasses version is definitely going to be the one on my holiday table. A very interesting way of preparing Brussel sprouts! I finally made these the other day and — I have to admit — you did not go overboard describing them. They were, hands down, the best sprouts I’ve ever had. Oh I’m so happy you liked them so much! My husband talked me into making these as an appetizer for a holiday party we are going to tonight…so skewered them them with some par-cooked bacon and when we get to the party I will throw them in the oven to finish them off…if we make it to the party that is, my husband doesn’t really want to share them, now especially since they have bacon wrapped around them, to be honest, neither do I. Thanks again for a new a way to psychopath love brussel sprouts! That’s so great to hear!!!! I’m totally thrilled! Merry Christmas!!! All I can say is I fixed these tonight and they are CRAZY good! Well, I made them again. This time for an October Fest party. They were the hit of the party, and quickly disappeared. They even complimented the Ach-tober-fest beer that our friend (a master brewer) brewed up for the party! Made them with vegetable oil instead of butter, and balsamic instead of sherry vinegar. So good! I just got through eating these for the first time, and let me say that I enjoyed them immensely. I halved the recipe since my wife does not enjoy sprouts…. I think next time I will add a bit more molasses and a bit more salt, but otherwise they were outstanding!!! I also like them sauteed identically but instead of adding the molasses, add cream….once they are ready add a splash of lemon juice and yum! MmmMmm. That does sound good. You are currently reading Really Crazy Good Brussels Sprouts at Five And Spice.